Hello, and welcome to JT Hughes. Today I'll be showing you around one of our used Approved Hondas. This one is a Honda CRV. It's the 2-litre petrol manual, which produces about 140-brake horsepower. As I said, it's a manual gearbox, with the EX spec, which is the complete top of the range. This one registered in 2012 on a 62-plate. This one is in Sparkle Grey Metallic and comes in absolutely fabulous condition. This one has reversing camera and reversing sensors. The CRV offers a fantastic size boot, as you can see. Those seats will fold down on a 60/40 split basis. Options with this vehicle include the two keys and also the rear Tonneau cover. The little handle there, just to make it easier to pull this very light boot down. As you can see, general condition very, very tidy, 18-inch alloy wheels, and the tyres, all over 3-millimetres. Anything less, we will just replace them. Front fog lights, and front parking sensors. HID headlights. This one will come with the benefit of having a 12-month Honda-Approved warranty. You can upgrade that for a further 12 months, so 2 years in total, for the cost of £299. Flexible finance is available on this vehicle also. You can play about with the finance calculator on our website. Service plans are also available upon this vehicle as well, whether you want to pay monthly or pay in one lump sum. As you can see, lovely place to be sat, full leather interior, electric adjustable driver's seat, a lovely panoramic glass roof, especially showing off one of the only days in Great Britain, where it's actually sunny. This one comes with a leather-wrapped steering wheel, and also satellite navigation. Now the one benefit of this vehicle, is its horrifically low miles, 17,728. It comes with a full service history, as well, and that mileage is guaranteed. Very, very nice and tidy vehicle. All the seats are in lovely condition. Nice car in general. 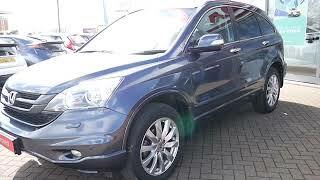 So there we have it, our Honda CRV. So for more information about this particular vehicle, please contact JT Hughes of Shrewsbury.